It has been seven years since a 12-year-old Maryland boy died from a tooth infection because his mother could not afford to take him to the dentist. Lawmakers across the country vowed to do something to ensure nothing like that could happen again. But today, nearly 200 million Americans have no dental insurance. And even many who do put off visiting the dentist because their insurer reimburses too little – or none – of the cost. That’s one reason more than a third of Americans did not see a dentist last year. And the number of ER visits for dental problems has skyrocketed. A discussion of America’s dental health crisis – and some ideas for solving it. Dr. Louis Sullivan Chairman and CEO of The Sullivan Alliance; secretary of Health and Human Services under President George H.W. Bush; president emeritus of the Morehouse School of Medicine. Colin Reusch Senior policy analyst, Children's Dental Health Project. Dr. Harry Goodman Director, Office of Oral Health Prevention and Health Promotion Administration at Maryland's Department of Health and Mental Hygiene; as a clinical dentist he worked at community health clinics in New Mexico. MS. DIANE REHMThanks for joining us. I'm Diane Rehm. Seven years ago, the story of Deamonte Driver stunned the nation. He was the 12-year-old Maryland boy who died from a tooth infection because his mother could not afford to pay for a dentist. Although dying from tooth decay is rare, many public health officials are alarmed by the state of dental care in the U.S.
MS. DIANE REHMJoining me in the studio to talk about why millions of Americans do not get the dental care they need, Dr. Louis Sullivan of The Sullivan Alliance -- he is former secretary of Health and Human Services -- and Colin Reusch of the Children's Dental Health Project. Joining us from WYPR in Baltimore, Dr. Harry Goodman, director of oral health for the state of Maryland. MS. DIANE REHMAnd throughout the hour, I'll look forward to hearing from you with your comments, your questions. Join us at 800-433-8850. Send us your email to drshow@wamu.org. Follow us on Facebook, or send us a tweet. And thank you all for joining us. MR. COLIN REUSCHIt's great to be here. DR. LOUIS SULLIVANThank you. It's good to be with you. REHMGood to have you all. Dr. Sullivan, give us a picture, an overall picture, of the state of dental health in America. SULLIVANWell, the dental health in America should be much better. Dental caries is the most common childhood disease. SULLIVANYes, cavities. As many as one-third on average of poor children have dental caries. And in some populations, it's almost half. So we have a preventable problem and a problem that could lead to much greater disease as we have all seen with the unfortunate case of Deamonte, the young sir who had a dental cavity, became an abscess, ruptured into his brain, and he died from meningitis. SULLIVANThat unfortunately is not the only such case like that. So we have a situation which really is preventable. It's amenable to appropriate education, prevention. So we know that we can do better because dental health is part of overall general health. So if we have children and adults without good dental health, we have many adverse consequences. REHMDr. Goodman, pick up on that. Why is good oral health so important to an individual's overall health? REHMI want to stop you right there, Dr. Goodman. Help me to understand how gum disease can be related to stroke or heart attack. REHMAnd what about dental cavities? Why do they potentially become so deadly? GOODMANWell, first of all, again, you know, when you're discussing cavities versus caries, dental caries is actually a disease. It's an infectious disease. It's a disease that -- where bacteria is transmitted. And cavities are really the end result of that. 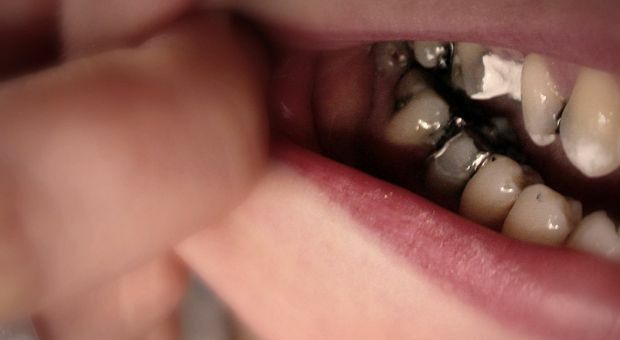 But cavities -- or caries, however you want to -- we talk about it today -- can have a dramatic impact on a number of issues that go even beyond health. GOODMANI honestly think it's about -- a lot about social justice and dignity, and you have an inability to learn, and you -- for instance, a child who's sitting in the classroom in pain with -- and unable to think about what the problem is being posed before them in the classroom, a child whose teeth may be so unsightly that they're afraid to smile and be kids, adults who may have missing front teeth and all of a sudden now are, simply by that factor, not employable. GOODMANAnd you have older adults who are either at home or sitting in long-term care institutions with deplorable oral health conditions where their inability to eat, as an example, may really obviously cause infection that could really set into place a lot of other factors. REHMAll right. And turning to you, Colin Reusch, as senior policy analyst for the Children's Dental Health Project, tell us about that project and the state of dental health among children. REUSCHWell, so, for instance, brushing with fluoridated toothpaste. You know, that's a simple one. But also things like making sure that children aren't going to take a nap with a bottle full of juice, or even milk, because, you know, the sugars in those substances being exposed to the teeth for extended periods of time are what increase the risk for tooth decay and feed those bacteria. REHMDo some children have a predilection toward tooth decay? REUSCHYou know, yeah. Genes certainly do include risk factors for tooth decay. And, you know, I think tooth decay is also caused by a number of factors, including social and economic factors. So when you consider folks who are living in areas where they don't have access to healthy food, that's going to impact not -- you know, that's going to impact their health broadly but also their oral health. REHMSo they're eating foods that move this process along? REHMDr. Sullivan, talk about why so many people are now going to emergency rooms for dental care. SULLIVANYes. This is a major problem because we have almost a million people every year who go to emergency rooms all over the country because they don't have a dentist, or they cannot afford a dentist. But dentists will not accept Medicaid, or their insurance is not sufficient. This is absolutely the wrong thing because emergency rooms are not the best places for dental care. I happen to be on the board of Grady Hospital, the public hospital in Atlanta. SULLIVANWe have dentists on staff, but they are not really set up to take care of dental emergencies in the emergency room. Plus, the cost in an emergency room is five to 10 times greater than it would be in a dentist office. So we want to have people visiting their dentist, visiting them early for preventive care, for health education because almost all of these problems are preventable. REHMYou said that there is a shortage of dentists in this country. I understand that that assessment is fairly controversial. SULLIVANWell, it's not controversial so far as I'm concerned. The Health Resources and Services Administration, a public health agency that looks at manpower issues all throughout the health spectrum, doctors, dentists, nurses, et cetera, they've estimated that we need at least 7,000 to 9,000 more dentists in the country to take care of the dental needs. But having dentists alone is not sufficient because we need to have people who will go into small communities, into rural areas. Dentists are not going there. REHMIs it distribution then? Or is it numbers? SULLIVANIt's both. We certainly need to have more dentists, but we need to also have another kind of health professional, dental health aide therapists, a program that began in Alaska some 10 years ago. I happen to be very familiar with it. Just a week ago, I was there for the 10th anniversary of this program. SULLIVANThese are young people who are high school graduates chosen by the leaders in their communities to train for two years under the supervision of dentists in the University of Washington School of Medicine where they receive basic science training and clinical training, more clinical hours than dental students receive. They go into these small villages. They provided care for more than 44,000 people in Alaska. They have changed the health landscape there. It's very dramatic, and indeed it's a very promising program. REHMDr. Goodman, do you believe there's a shortage of dentists in this country? Or is it rather distribution? GOODMANI actually feel it's distribution. But I think that there are many good models out there, and I think we need to be looking at all of them because this is a really a multi-factorial problem that requires a multi-factorial response. And I think that while it's great to be looking at these new workforce models and we all want to see them succeed, I think that the emphasis has been misplaced. I think the emphasis has been misplaced more on treatment rather than prevention. GOODMANAnd I think that if you just continue to try to drill and fill and extract teeth to solve this problem, it's going to be much akin to a dog chasing its tail. You're going to get nowhere. We need to start at the root causes of this problem which is prevention. And that means basically starting even with our medical colleagues, starting with pregnant women with their OB/GYNs and beginning that process. And I think there's data that shows that high risk kids who get -- who have a preventive dental visit by age 1 do far better, cost far less dollars than high risk kids who have a preventive visit after age 1. REHMDr. Harry Goodman, he's director of the Office of Oral Health Prevention and Health Promotion Administration in Maryland. Short break here. And when we come back, your calls. REHMWe're talking in this hour about dental health and the care that people across the country do or don't receive. Here in the studio with me, Dr. Louis Sullivan. He's CEO of the Sullivan Alliance and former Secretary of Health and Human Services under President George H. W. Bush. Colin Reusch is senior policy analyst at the Children's Dental Health Project. REHMAnd joining us from WYPR in Baltimore, Dr. Harry Goodman. He is the director of the Office of Oral Health Prevention and Health Promotion Administration in Maryland. We did invite the president of the American Dental Association, Dr. Charles Normal. He was to be on with us at this point, but just a few moments ago told us he was too busy to be part of the program. I have a feeling, Dr. Sullivan, that one of the reasons Dr. Normal bowed out is because of the ADA's total disagreement with the idea, as you described it, of dental therapists. Tell us what's happening there. SULLIVANYes. The American Dental Association has been very active in opposing this. They actually brought suit in Alaska when the Native tribes developed the program to try and prevent it from being developed. Dental therapists exists in many countries around the world, Canada, Great Britain, Australia, New Zealand. And the Alaska tribes, in 2003, sent their young people to New Zealand because there was no such program here, for two years. And they were so pleased with the outcome, with what those young people learned and the services they were able to provide, they established their own program in Alaska. REHMWhy is this so controversial? SULLIVANWell, I think there's a mistaken concept among many dentists that this is competition for them. I think they are wrong. We had a similar issue in medicine in the 1960s and '70s when nurse practitioners and physician's assistants were developed. They were developed, by the way, by a medical school. Duke University School of Medicine led in this effort. It was controversial then, and unfortunately some of my colleagues in medicine resisted it, similar to what's happening today in dentistry. But that battle is, for all intents and purposes, over today. REHMDr. Goodman, what's your response to dental therapists? GOODMANAs I said earlier, I believe it is an option. And I think we're all looking with great interest to see if it's going to be effective. Of course, Minnesota's had a law in place now for a few years. I have great respect for what they're doing up in Minnesota. But we still have to see what the results of that are going to be. REHMWhat is that law that's in place? GOODMANTo allow dental therapists to practice. REHMAh. And to you, Colin Reusch, the idea of dental therapists working with children. Does that make sense to you? REUSCHWell, I think there's no question that the dental therapists have been able to provide necessary care in areas where children and families would otherwise be unable to receive it. But I think we also have to be careful not to back ourselves into corner in assuming that dental professionals are the only ones who are able to impact oral health. You know, the Affordable Care Act and leading health panels like the Institute of Medicine have called for a more team-based, patient-centered approach to care. REUSCHAnd when we look at that shift, you know, that presents many opportunities in terms of workforce, but that can also, you know, look a number of different ways. And can take the form of, for example, social workers and community health workers, going out into the communities and educating folks about oral health. REHMHelp me to understand, Dr. Sullivan, why so many Americans don't have dental insurance. One would think that teeth are part of the entire body. Why aren't they covered under the Affordable Care Act? SULLIVANWell, I agree. The Affordable Care Act does have a provision that really makes access to dental insurance for more than five million young people. Unfortunately, because of costs and other reasons, a number of families are not taking advantage of that because it is an extra cost. We need to enfold dental insurance into comprehensive medical insurance so that it is affordable. SULLIVAN…than dentists. So this is really not something that's new. It's something that the United States has not had, but other Western countries who have good health systems have it. And it's really about time that we also have it in the United States. REHMAll right. Here's an email from Chris. He says, "I spent years with serious dental problems as a result of an accident. Medicaid did not cover any services I needed. We saved our tax returns for two years to finally pay for the service I needed. When I think back to all the pain, the missed work, the sleepless nights, when I honestly considered taking my own life to escape the pain, I cannot understand why this is not something considered as necessary as access to medical care." Why not, Colin? REUSCHWell, I mean, I absolutely agree. And I think we're looking at a long-standing separation of oral health from overall health. We have a separate financing system for the most part, where dental insurance is sold as a separate product in most cases. We have a separate delivery system for the most part, where oral health is not a primary focus of healthcare professionals outside of the dental office. REUSCHAlthough, I think we're seeing a bit of a shift with policies like the Affordable Care Act. We're seeing more health plans that are including at least children's dental coverage as part of that entire package of services. So I think, you know, we have a lot of work to do to insure that oral health is as important as every other aspect of health. REHMDr. Goodman, here's another posting on our website. And it reads, "If you mandate dentists to accept Medicaid at the current reimbursement rates, you will see lots of dental practices go bankrupt. Closed dental practices mean even less access to dental care. The real problem is our government won't fund Medicaid or Medicare for dental procedures. And the paperwork that comes with reimbursements is a headache for everyone. Also, it's easy to blame dentists. How many people around you do not brush twice a day and floss daily?" Dr. Goodman? GOODMANWell, I'm certainly not going to put the onus on the public in terms of that. I think we haven't done a good enough job and there are a lot of strategies, if we're able to talk about them, in terms of oral health literacy and reaching the public for that very thing. But I think that, again, we are -- we need to be looking at bigger systems issues. And it is absolutely true that the federal government does not mandate Medicaid coverage for adults. If a state wants to do it, it has to do it, basically, on its own. REHMAnd they have shrinking budgets of their own. REHMDr. Goodman, after the death of Deamonte Driver I know that Maryland made some changes. Explain what they did. GOODMANWe made, really, a lot of changes, Diane. First of all, as a state oral health programs we always -- and we follow a dictum from the Association of State and Territorial Dental Directors. Our main mantra is to collaborate and partner. And that's what we instituted. It was an emotional period for us in Maryland. One of the richest, if not the richest state in the country. And so we went upon a collaborative process, with a shovel-ready plan, by the way. GOODMANA plan that we already had been discussing for years, but basically no one had been listening until unfortunately, and this is the human psyche, an event like the death of a 12-year-old child just sets things into play. So we really went about with the support of our -- certainly of our then health secretary, our governor, lieutenant governor, our federal legislators have been amazing, and our state legislators, to institute a number of reforms in the state to make the Medicaid program, not only pay better, which it now does, but also more user friendly to dentists. GOODMANI think that email you heard, the dentist had remarked about the paperwork. Well, we went about doing those -- addressing those types of issues, making the paperwork less cumbersome, making credentialing a lot easier, having a user friendly system in place when there was a problem. And, of course, we increased the fees. And that wasn't our only reform. We also expanded the public health network. We also expanded our public health workforce. REHMYou know, it's so interesting that when I was a child here in Washington, in elementary school, we had dental exams twice a year. The dental hygienist or the dentist themselves came in, gave us an exam, we went home with either a white card, a pink card or a yellow card. And goodness knows, we did not want to go home with anything but a white card. The whole thing about childhood dentistry, kids are afraid of dentists. What has the profession done to make it easier for young kids and less painful for young kids to go the dentist, Colin? REUSCHWell, I think that the primary solution that many, you know, that the dental community has taken is to focus more on preventing the disease in the first place. REHMBut once you're there, come on, now. Be honest. REHMThat it's scary and that it can hurt. Dr. Sullivan? SULLIVANOh, yes. No question about it. A number of dentists and dental hygienists and assistants really have improved their cultural competence. And certainly in the program in Alaska, first of all, these young people come from the villages. They know the culture. They really play -- they have waiting rooms that are friendly to children. So that children look forward to the encounter. They know how to give care without all of the pain and angst that we're used to. SULLIVANSo that really is an improvement. And I agree, we need to have a dentist, we need to have dental hygienists, dental therapists. In medicine, we have more than doctors. We have physician's assistants, nurse practitioners, community workers. So we need to have the same panoply in dentistry. REHMAnd you're listening to "The Diane Rehm Show." I want to open the phones now, 800-433-8850. Let's go first to Chris, in Ft. Lauderdale, Fla. Hi, you're on the air. CHRISGood afternoon, Ms. Rehm. Thank you for taking my call. CHRISThank you. I have just two quick points like your guests to talk about. CHRISDental insurance you talk about a lot. Most plans have dental insurance, but it covers like two cleanings and like 10 percent of the rest of it. So it's really paying it for by myself. And then also, the kids being afraid. The only time they go to the dentist is when it's really a problem and they have to see the drill or get a tooth pulled or something like that. If they went five, six times, just like a little cleaning or something else, they wouldn't be so afraid when it's like a cavity has to be dug out. REHMSo do you go to the dentist twice a year? CHRISMyself, I do now because, you know, I have insurance and I do get cleaned twice a year. But any type of a root canal or a crown or a bridge or something, it really pays, like, you know, 15 percent. And then the rest of it is out of your pocket. Where health insurance -- and normally you have like co-pay, $50 doctor co-pay. Why not a $50 dentist co-pay? REHMThat's an interesting point. What do you think, Dr. Sullivan? SULLIVANWell, I certainly agree with the fact that we need to look at our reimbursement system. We need to simplify the paperwork burden that dentists and others have. But we need to have all of our professionals committed to seeing that our population and certainly our young people are given service. So that is really my main focus. All of us in the health professions are attracted because we want to serve people. SULLIVANWe want to help them with their health needs, help make them better. There are practices using dental hygienists and dental therapists that are profitable. Minnesota has shown that. So this is something that can be well-organized. It's been done in medicine and it can be dentistry as well. REHMAll right. To Janet, in Miami, Fla. Hi, you're on the air. JANETThank you, Diane. Just wanted to comment. Somewhat to what the gentleman previous to me said, it's absolutely unaffordable. That's why most people don't use the dentist. We have dental plan and it's still -- a root canal in south Florida, it does not come down from $1,500 for a root canal to $2,000. That is with dental insurance. So I can't imagine anyone to actually, you know, be able to afford it. It's just absolutely ridiculous. REUSCHYeah, you know, dental insurance hasn't traditionally operated like a true insurance product. And it, you know, in contrast to medical insurance, it typically has dollar limits on coverage that around $1,000 or $1,200 a year. So once you reach that limit, you're on the hook for the cost of everything after that. REUSCHNow, the Affordable Care Act has made some changes to dental insurance for children, in that it eliminates those annual and life-time dollar limits. So the kids can get more of the care they need and afford it. But, you know, for adults, dental coverage still remains this sort of very limited benefit. And that's a problem. REHMOne quick question, Dr. Sullivan, why do you believe there's a shortage of dentists our there? Are they going for more profitable kinds of medicine? SULLIVANWell, the reality is that the increase in the number of dentists in the country is slower than the increase in the population. The projections from the public health service are that we need 7,000 to 9,000 more dentists to meet the needs of the population. REHMAll right. And we're going to continue to explore why, when we come back, after a short break. Stay with us. REHMAnd welcome back as we talk about the state of dental care and dental health in this country. Here's a very interesting email I would like to hear both Dr. Goodman and Dr. Sullivan respond to. It says, "I'm hoping to hear what your panel has to say about Americans going to Mexico and India for dental care because it's so much more affordable. My husband and I are seriously considering a trip to Mexico. The cost including travel is one-third the cost to have the same work done here." REHMAs a matter of fact, there was a piece on Morning Edition the other day about people going to Mexico and really having the trip focused on that actual dental care. What's your response, Dr. Sullivan? SULLIVANWell, first of all, I would say it's unfortunate that that occurs. I understand the financial pressures. And I think we, in the United States, need to focus all of our energies on making care affordable so we don't have this. Because people go abroad, we have no idea of the quality of the care that they're receiving. REHMBut they -- patients come back totally happy. It's not as though the quality of care is necessarily poor. They come back, they're totally happy and they pay one-third the price. That doesn't say to me that the quality of care is necessarily not as good as what American dentists provide. SULLIVANWell, that's great. I think that's fortunate if that occurs. The point I'm making is this. In the United States our accreditation standards, our quality measures are things that we can rely on. We know what we're getting. Abroad you may get, and indeed, many cases do get very good care. But we have very little knowledge about those programs. So I think you're really taking a risk. If you know someone, they can vouch for it then of course that's fine. GOODMANAnd I absolutely agree with Dr. Sullivan. And again, I think by our focus right now on, you know, that we need to be, first of all, making sure that we have ample Medicaid coverage in this country. And that means adults need to have coverage. And we need to start that dialogue and that discussion. And I'm hoping that the data that comes out of emergency rooms lead to that. But, again, I think we're missing the bigger point. And the point is that we need to start preventing this disease from the outset so these individuals are not in a situation in their adult years where they have to go to Mexico to get their care. GOODMANAnd Dr. Sullivan made many very excellent points about some of the issues there including what kind of follow-up care. If you come back to the State of Indiana, as an example, and there's a problem where are you going to go then for your care? So in terms of continuity of care but we need to begin discussions about preventing this disease. And there's a multidisciplinary approach using our medical practitioners as well as our dental practitioners and any workforce motto we can come up with to try to address this problem. We know how to prevent disease and it was the tragedy of Deamonte Driver. REHMAll right. Okay. Let's go to Mira in Cincinnati, Ohio. Hi there. REHMI'm sorry, Mira, there seems to be some noise in the background. MIRAOh, okay. Let me -- is this better? REHMYes, that's much better. Thank you. MIRAOkay. Yes. I went to a dentist, got a good exam and everything. And then I was told that several crowns would be needed. And before I could say anything, she said she had to go to the next client -- her next patient. And I told the person in the -- at the office there that I needed to know more about how much crowns cost and whether other things could be done. And I got a letter -- because the person in the office looked at me like she didn't know what I was asking for. And I got a letter of dismissal that said, this is not a good fit. REHMYes, I can certainly understand that. Dr. Sullivan, what do you say to Mira? SULLIVAN...how much it's going to cost so there's no surprises. I think part of being a good professional is really being honest with your patients, not springing surprises. So I say that she is absolutely right in expecting to get information so she knows what she's dealing with. REHMAnd what is it that may prevent, Dr. Goodman, a patient from getting everything he or she wants before undertaking any kind of, you know, crown or anything of the sort? GOODMANThere shouldn't be. I mean, absolutely that health care practitioners, whether it be medical, dental, what have you need to very, very sensitively in a cultural manner that understands individuals' backgrounds communicate all types of information. That would include obviously the cost of any kind of treatment but also include how to prevent disease. And I think that's where, again, our system has failed. And I think there are new movements underway to train dental providers, medical providers, what have you, to be able to speak to their patients in a way that's both culturally -- that's culturally sensitive in a manner that they truly understand what's being done. GOODMANBut absolutely have to communicate those messages. REHMLet's go to Robert in Arlington, Texas. You're on the air. ROBERT...Diane. I was born in 1952 and I had perfect teeth up until 1994 when I broke my back at work. the company didn't want me back. I was -- I'm currently on, well, Medicare I guess you call it. But out of all the medicines that I was taking because of this -- the pain after the broken back, I mean, I have steel rods and screws. Pain never went away from the broken back. ROBERTI was told by a dentist later on when ten of my teeth needed to be extracted that it was from dry mouth syndrome. I'd never heard the term in my life before. And now last year I had to have all the rest of the teeth pulled. Now I have a full set of dentures. And I watched dentist office growing up in this area that doctors would never think of building buildings like this. REHMWell, let's not get off into that track. I've never heard of teeth being extracted because of dry mouth syndrome. GOODMANMay I comment, Diane, on that? GOODMANIt's a condition called xerostomia. It's -- and there are many, many conditions, especially as we get older whether it be through medications, what have you, that do dry your mouth. And saliva is a true buffer. It provides many nutrients to the teeth and keeps them in a manner that they're going to be healthier. So, yes, when your mouth is dry you are at higher risk. The teeth gets brittle and there's much higher risk for too decay. It doesn't mean that they have to be extracted because of that. I can't comment on that but certainly that's a risk factor. REHMAnd do some medications bring on dry mouth syndrome? GOODMANAbsolutely, many medications. And I'm sure for his -- the steel rod in his back, what have you, the medications, and he probably had to take many of them, do cause it, as do, by the way, anti-asthmatic -- anti-asthma medications as well cause dry mouth in children. SULLIVANDiane, if I might comment. SULLIVANI think this is another example, as Dr. Goodman has been emphasizing, of the need for preventive care. I think this is one of the reasons why individuals should see their dentist at least once a year for prevention. And I agree, all of the professionals in dentistry and in medicine really should enhance preventive services. And we are making progress, though I agree we are far from where we should be. REUSCHI think this is a prime unfortunate example of why we need better coordination of care across the disciplines so that oral health is a focus of physicians. And when they're prescribing these medications they're making sure that their patients understand the risk factors. REHMAll right. Let's go to Jan in Dallas, Texas. Hi there. You're on the air. JANThank you, Diane, for taking my call. I really appreciate it. I have a unique perspective on -- actually on dental industry inside or on the workforce side. And, you know, I started conducting research when I started noticing a change in access to care. I'm on the manufacturing side which manufactures dental crowns, bridges, partials, dentures, implants. And we used to have an industry of laboratory owners, which is about 15,000 strong and today we have approximately about 7500 dental laboratories because of outsourcing and offshore outsourcing. JANBut in my research back in 2000, the oral health in America came out with a report that said basically that the nation as a whole was in the midst of a silent epidemic and children were the greatest risk. In 2003, Richard H. Carmona came out with a report and was a national call to action. Immediately when I found this out I went and talked to colleagues. And they weren't really interested because it was the wave of cosmetic dentistry. And you could see where general practitioners were, you know, now stating that they do cosmetic dentistry. JANWell, cosmetic dentistry comes from the dental laboratory side working in conjunction as a team to manufacture those restorations for those doctors to put into the patients mouths. And the high cost of dentistry is what is keeping the population from accessing dentistry. Because of the cosmetic wave, the price of crowns and bridges escalated because it now had become a cosmetic product. And so there we stand. How can a dental practice go and reverse their fee for service, you know, when the cost of the restoration, they can't do that. They can't do it because it's just not a business decision. REUSCHWell, I want to reiterate her point that, you know, more than a decade ago the surgeon general called tooth decay a silent epidemic. And while we've made great strides in expanding access and coverage, still we're in a situation where nearly half of all kindergartners are entering school with tooth decay. And so really the emphasis needs to be on prevention before a child even sees a dentist. GOODMANThat's correct. Especially, you know, if we can get kids either through their medical providers or straight to the dental office by age one, we're not going to have this issue. And even you mentioned earlier about being afraid to go to the dentist, if a child starts going to the dentist at age one it's going to be part of the family culture in essence. And usually at that point, there are usually no problems. And so they're basically -- a trip to the dentist means going to the dentist, you know, getting their teeth looked at, cleaned, having some fun, maybe getting a toy afterwards and that's it. GOODMANIt's not connected with pain and fear. That becomes a self fulfilling prophecy if you delay going to the dentist as early as possible. And again, those routes into the dental office can be through the medical providers as well. REHMAnd you're listening to "The Diane Rehm Show." And here's an email from Pete who says, "I wonder whether dentistry might be the first area where Americans would agree to try national health insurance. I'm the son of a dentist. I have a terrific private dentist but the predicament many people are in who cannot afford dentistry is glaringly apparent every time they smile." Pete finishes by saying, "I think it's time to level the playing field." What do you think, Dr. Sullivan? SULLIVANWell, sugary drinks, for example, cleaning our teeth after every meal. Visiting the dentist once a year. All of these things are important. REHMBut we have been told that for years and years and years the fact of the matter is that prices are going up. And the question is, how to deal with the cost of dentistry, Colin. REUSCHWell, I think universal coverage would be great but coverage is only one piece of the puzzle. You know, we have a situation where one in three uninsured kids have untreated tooth decay compared to one in five insured kids. But, you know, dental disease is concentrated in a small portion of the population. And those are the kids at highest risk. REUSCHAnd even when they do get treatment, often these kids end up in the operating room. And then, you know, the disease isn't really being managed. And so a year later they're back in the operating room. And that's not only dangerous care in a lot of situations. They're undergoing general anesthesia, but it's very expensive care and it's not doing anything to stem the disease so it doesn't progress further. REUSCHAnd when children have dental issues they tend to become adults with dental issues, more serious dental issues. And about 62 percent of new military recruits are unfit for deployment as a result of a significant dental issue. REHMI had no idea of that. So teeth are an extraordinarily important part of onceover all health. REHMTherefore one should think of dentistry as something of the body as a whole. REUSCHBut we should also be thinking about how that care is delivered. So those high risk kids may need to come in more than twice a year, but our model is more of a one-size-fits-all approach. REHMAnd who are these high risk kids? REUSCHWell, they tend to be the same kids who are at high risk for other diseases like diabetes and, you know, ultimately heart disease. They're low-income children predominantly. They're minority children predominantly. And, you know, it's unfortunate that these kids are at high risk for so many different conditions. REHMAll right. And I'll have to leave it at that. Colin Reusch of the Children's Dental Health Project, Dr. Louis Sullivan. He was the health and human services secretary under President George H. W. Bush. And Dr. Harry Goodman in the Maryland Department of Health and Mental Hygiene. Thank you all so much.